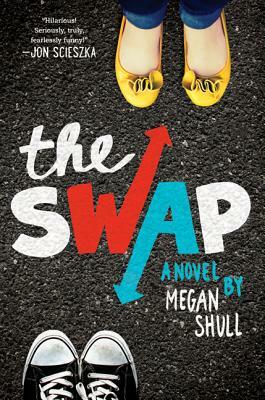 If you like the concept of comedic body switches a la Freaky Friday, then it's time for you to read Megan Shull's novel The Swap. Note that I said comedic "body switches" as opposed to horror-movie-style body swaps - those are invasive and terrifying, whereas The Swap is a smart and sensitive look at what it would be like for two middle school students of opposite genders to switch places. When an encounter at school causes them to unwillingly swap bodies, thirteen-year-old Jack and twelve-year-old Ellie have to figure out a way to deal with their very different bodies, families, friends, and afterschool obligations until they can swap back. Before this unexpected event, the kids weren't friends. They go to the same school, so they vaguely knew each other - with Ellie being more aware of Jack than vice-versa - but they are a grade apart and don't have any classes or activities in common. By the time the book is over, though, there's no way they could call themselves strangers anymore. This story is about more than temporarily being in someone else's body - it's about sharing someone else's life. The decisions the protagonists make and the actions they take while walking in each other's shoes (including Ellie's soccer cleats and Jack's hockey skates) affect them both. Seeing the world through new eyes changes how they see others and how they see themselves. And back to the body sharing: where some sitcoms, books, or movies might play awkward moments in the locker room and in the bathroom as silly and/or gross jokes, these kids are truly uncomfortable at those times, and ultimately very respectful. You could say that the two parental figures in the book are both devoted to their children, but they are definitely at opposite ends of the emotional spectrum. Ellie's mother, a divorced single parent and yoga instructor, is upbeat and sunny. Jack's stern father, a widower, is very strict with his four sons. Very strict. Think Captain Von Trapp. He oversees their daily fitness routine and year-round hockey training and makes them call him "sir." Ellie's mom wishes her daughter would be more open with her, while Jack's militaristic dad doesn't do heart-to-heart chats. Jack has a whole bunch of buddies and gets along very well with his brothers. Meanwhile, only child Ellie feels like she doesn't have a friend in the world. Sassy, her best friend since kindergarten, has found a new best friend and now finds it fun to say mean things to Ellie (and Jack-as-Ellie) at school, on the soccer field, and at a memorable sleepover. Anyone who has had a friend turn on them, especially in middle school, will relate to that heartache. Friendship break-ups can hurt just as much as romantic ones. Not all friends make up; not all friends should. Kids and adults alike should keep this in mind: If someone is being mean to you and repeatedly putting you down, that person is not a true friend. Both Ellie and Jack are healthy and athletic, which is really cool. It also comes in handy when they have attend each other's practices and tryouts. I also appreciated that the sports storylines didn't culminate in either character winning the big game or being chosen MVP; instead, it was about personal successes, about what the work taught them about themselves and how it pushed them outside of their comfort zones. There was also a neat sporty bit towards the end of the book that I wasn't expecting, and I liked a lot. I've read a lot of books with dual narratives, and The Swap is a solid example of a story that both needs and benefits from two narrators who offer honest first-person thoughts. Without making them polar opposites, Shull has her characters speak and react differently, with some overlap - it's fun when they start realizing that they've picked up each other's lingo. The narrating duties flip back and forth in alternating chapters, and the story is easy to follow. The Swap considers the different ways we treat girls and boys, the different things we expect of our sons and daughters, and it's a great take on upper middle school life, a time that a lot of TV shows glaze over, jumping from little-kid-dom right into the teen age rather than dealing with the simultaneous horrors and happiness of those in-between wonder years. For those of who you have yet to read the original novel Freaky Friday by Mary Rodgers, do yourself a favor and pick up that book at the same time you pick up The Swap. Also grab Megan Shull's previous releases, including Amazing Grace. 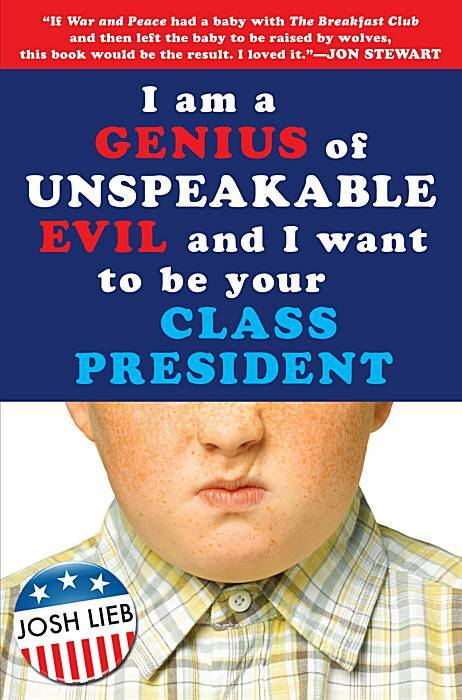 I first picked up I Am A Genius of Unspeakable Evil and I Want to Be Your Class President based on its deliciously verbose title and its endorsement from Jon Stewart (“If War and Peace had a baby with The Breakfast Club and then left the baby to be raised by wolves, this book would be the result. I loved it.”) When I discovered that its author was one of Stewart’s executive producers, and that it had come out in paperback, I could no longer resist its evil, evil charms. I was quite wrong about it, though. I thought Genius was going to be more or less realistic fiction about an over-intelligent, misanthropic kid running for student body. As it turns out, I was a tiny bit wrong about that “realistic fiction” bit. The story’s protagonist is Oliver Watson, a thirteen-year-old kid who may be overweight but who is also the third wealthiest person in the world. An evil genius, he built his fortune from a single petty crime (stealing some money from his mother’s purse) and carved out an empire of subterranean tunnels accessible from his bedroom or a secret locker passageway. He’s a blimp-piloting, minion-smacking, evil gadget-inventing mastermind who, as a seventh grader, holds the strings of any number of puppet corporations and countries. Oliver is determined not to divulge his crazily successful alter ego, and so he lives his life as a very convincing idiot. He’s got everyone fooled into thinking his shoe size exceeds his IQ – classmates, teachers, even his mother and, importantly, his father. It turns out that Oliver is motivated, not by greed, respect, or a desire to change the world, but by a consuming dislike for what he sees as his self-interested and small-minded father. He’s also motivated by puppy love, but that’s another story. As Oliver’s best intentions fall apart around him, he ends up in an amusingly messed-up race for student body president, gets cut down a size or two, and maybe even grows up a little bit. But that’s not why you should read it; you should read it for the footnotes. I’d say that Genius would be what happened if a Daily Show writer re-wrote Catcher in the Rye as a superhero comic book, but since that’s basically what this is, I guess I’ll just say that if you're ready for a good, smart laugh, find yourself a copy and buckle your seatbelt. For kids who like tales about intelligent rodents and/or planes: Lindbergh: The Tale of a Flying Mouse by Torben Kuhlmann. A mouse whose compatriots have fled the country due to the introduction of a new mechanical mousetrap is unable to leave himself. Mistaking bats for flying mice, he is inspired to create a flying machine of his own so that he, too, can escape. Yeah, this is a picture book so it skews younger than the Guys Lit Wire intended audience, but the story is inventive and the artwork flat-out stunning. One of my favorites in a year of outstanding picture books, I've been pushing this on readers of all ages. For superhero comic book fans: Super Graphic: A Visual Guide to the Comic Book Universe by Tim Leong uses infographics (a few samples) to chart the world of comics. For precocious or aspiring foodies: Anything That Moves: Renegade Chefs, Fearless Eaters, and the Making of a New American Food Culture by Dana Goodyear is a wild look at adventurous eaters and food movements, in a very New Yorker way (Goodyear writes for the magazine). Dan Barber's The Third Plate: Field Notes on the Future of Food is a more detailed look at agriculture, sustainability, nutrition, and food traditions. 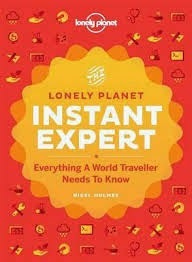 Hmm, I made that sound really boring, but the book is full of fascinating people and information. While the viewpoint is limited, it does provide a lot of, well, food for thought, especially for people who care about food. For readers looking for a character they can really root for: I'm not the only person calling The Martian by Andy Weir a favorite book of this year. Partly because it's really smart, partly because it's really funny, partly because it's really suspenseful. (I mean, there must be a reason so many A-list names are involved in the film adaptation, right?) But I wonder if, in a year that has seen so much despair and senseless violence, The Martian's optimism and perhaps old-fashioned can-do attitude has provided a much needed antidote for readers. In any case, I highly recommend this both to science fiction fans and science fiction avoiders--it is that awesome a book. 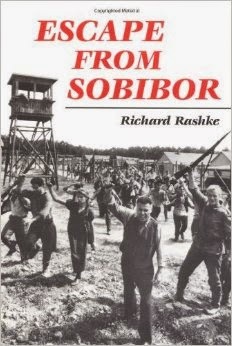 Escape from Sobi­bor by Richard Rashke is a non-fiction book which details the biggest escape from a Nazi con­cen­tra­tion camp in Poland dur­ing World War II. The book was first pub­lished in 1982 and won acclaim world wide.Escape from Sobibor by Richard Rashke is an excit­ing his­tory book, told as a novel. The book is divided into three sec­tions which intro­duce the peo­ple, tell about the escape from a top secret Nazi death camp, and the after war years. Mr. Rashke knows that the strength of any book, non-fiction or oth­er­wise, is the per­sonal sto­ries which make up the big pic­ture, and does a great job intro­duc­ing us to them. The peo­ple which the author chose to focus on were non-military Jews and a Russ­ian offi­cer, some were pulled out of the lines for the gas cham­bers due to spe­cial skills and some just by pure luck. The author engages the reader from the start with per­sonal pre-war sto­ries. This is not just a his­tory book about the escape itself, but about peo­ple we care about and the heart wrench­ing deci­sion they had to make in order to survive. The cru­elty and bar­bar­ity of the Nazis is also talked about, con­trasted by the strength of char­ac­ter of the pris­on­ers, as well as their men­tal anguish. Unfor­tu­nately, many of the Nazi crim­i­nals were never pun­ished for the their actions and brutality. Once the pris­on­ers escaped, the author details their strug­gle to sur­vive in a hos­tile envi­ron­ment, either hid­ing from the Nazis, being take advan­tage of by the local pop­u­la­tion or the par­ti­sans. Some of the escapees hap­pened upon brave peo­ple who helped them, some were not so lucky. Some of the sur­vivors were still liv­ing at the time the book was pub­lished, a few even took up arms and went back to fight the Nazis. 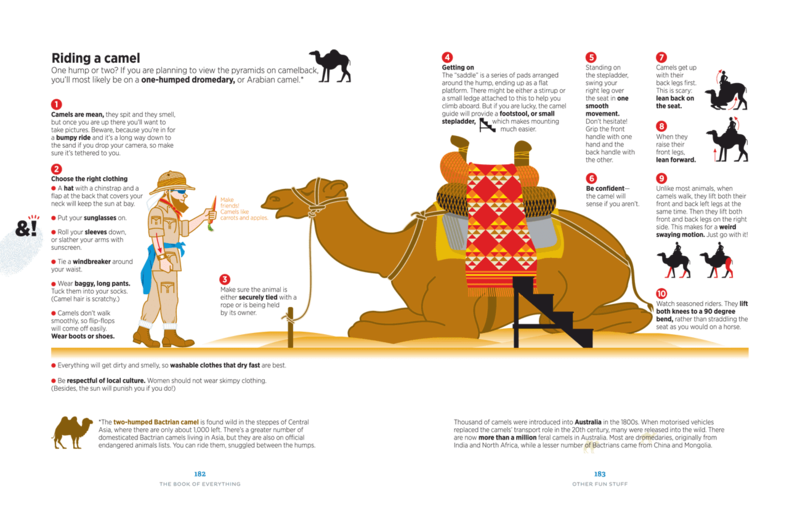 This book has many themes about sur­vival, free­dom and more. A must read for any his­tory buff or World War II enthu­si­ast. This mov­ing book might be grim, it is also inspir­ing and vividly recounts an event which most of the world has never known before it was published. In middle school, I used to take all my allowance and blow it on a fist full of comics. Every week or so, I'd bum a ride to the local comic book store and load up on anything that looked interesting, then pore over the fat stack of magazines all afternoon. It was a pretty good time to get into comics. Not only were the big superhero publishers putting out some pretty good stories, but there was a burst of weird, amazing, and fantastic independent and art comics appearing on the shelves those days. Over the years, as graphic novels have come along, I've drifted away from the thrills of "comic book day," but there's a bunch of really great comics titles out right now, so I figured I'd talk about some that really excite me! 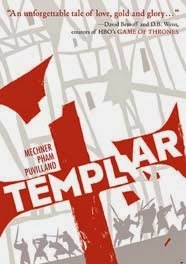 "Much nonsense has been written about the Knights Templar over the years," writes Jordan Mechner, creator of the awesome graphic novel, "Templar." He's right, there has been a lot of nonsense written about them. One of my favourites is that they stole un-published works of Shakespeare and hid them on Oak Island, Nova Scotia. Then there's the myth that they were all arrested on a Friday the 13th, forever marking it as an unlucky day, a day that would spawn countless terrible campfire stories and movies. I'm looking at you, Jason Takes Manhattan. There's no nonsense in Mechner's Templar. He uses actual speeches from the Templar's leaders, members and detractors. Mechner re-creates 14th century Paris as meticulously as he can. We see both sides of the human experience, the gold-lined palaces, the poor wretches living in their own filth and the people who are just trying their best to survive. This is probably what I loved the most from this book, Mechner doesn't gloss over anything, but he doesn't exaggerate either. Don't get me wrong, the book gets pretty dark at times, especially when depicting the Siege of Acre and the resulting massacre of the prisoners. Sometimes when an incident occurs eyewitnesses have a different take on what exactly occurred. What they see is often colored by their experiences and prejudices. That is the case in Kekla Magoon's fantastic book for teens called How It Went Down which deals with the fall out from the killing of an unarmed black teenager called Tariq by a man named Jack Franklin. As (bad) luck would have it Franklin just happens to be white. 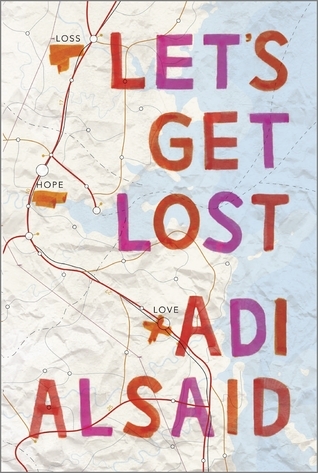 LET'S GET LOST is the debut contemporary coming-of-age novel by Adi Alsaid, and he really gets it right the first time. This is a strong story that I highly recommend to anyone wanting a good contemporary story about love, friendship, family, and adventure. LET'S GET LOST is told in 5 parts, each one from a different character's point of view. I absolutely loved having multiple points of view in a single story - this is something that doesn't happen enough in YA fiction. Some guys - bless 'em - know exactly what they want and can articulate it when it comes to books. I was not one of those guys, and that inability to express my general interests ended up in some, er, interesting book selections when I was a teen. I suppose that year I got a book on identifying rocks and gems came from the haphazard collection of stones I had picked up while camping, but that was an earnest mistake; to this day I have no idea what to make of my getting Jonathan Livingston Seagull when I was 13. So what follows are a short collection of books that I have found nifty recently that, if not perfect gift selections for some guy you know, may at least provide potential book ideas for that mumbly, mopey dude over there hoping no one asks him what he's into. I can’t speak to the idea that I have ever wanted to be an expert in half of the skills listed inside this book, but the teen know-it-all inside me loves this visual compendium of high-end trivia and how-to guides. Just a random page test can yield startling results: how cheese chemically can be as addictive as opiates; what the little pictographs on clothing tags mean in terms of how to wash items (especially when the print is so tiny you can’t read it); things you need to know to be a dog walker… or a gondolier; even how to be a blogger! It’s a rather tongue-in-cheek approach to becoming a jack of all trades but makes an informative jumping off point for conversations about possible careers, or just a jumping off point for conversations in general! please click for full effect! Ever wonder why dogs don't write more poetry? Well, if you have (or if you have now that I've framed that question), this book is for you. 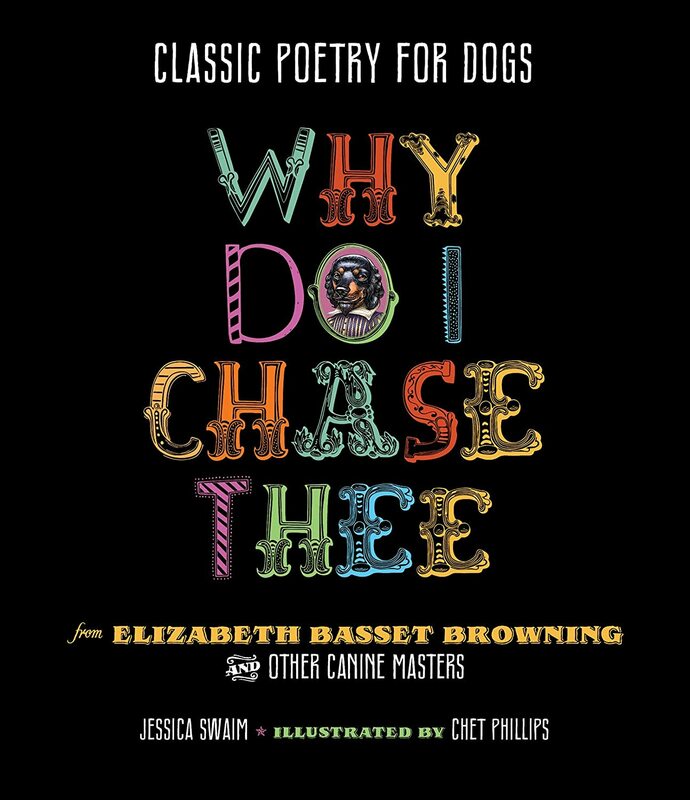 Jessica Swaim has come up with a bookful of parody poems, in which celebrated dog poets explain lots of things . . . why they chase their tails, how fish compares to meat ("thou art more flaccid and more apt to spoil"), the horror of being neutered, and more. And was always a nose. 'Til it glistens and glows. Or a tail, I suppose. We are told not to judge books by their covers. We should also not judge books by their titles: Dirt Bikes, Drones, And Other Ways To Fly is neither Twitter- nor acronym-friendly (DBDAOWTF?). Based on the title, I didn’t expect a moving study of how we respond to grief. Based on the title, I didn’t expect a thoughtful exploration of the morality of military drone use and how our nation’s military engagements affect small-town America. And, based on the title, I didn’t expect the novel to explicitly incorporate the Emersonian concept of the Over-Soul either. But Conrad Wesselhoeft addresses all these and more in his young adult novel. A blurb on the back of Clay's Way calls it "a gay Catcher in the Rye," and that was almost enough to make me not read the book. Mind you, I love both those things - Catcher in the Rye, and... gayness... but I've seen so many weak books flogged as "the next Catcher in the Rye" that it's become a code word for "book that tries too hard to do something that's already been done." Fortunately, I got over myself. And read Clay's Way. And it was amazing. And in the end, I thought to myself, yeah, wow, it does kind of hit the same emotional sweet spot as Catcher in the Rye. Not because it's imitative, or even because it treads similar ground, but because it has the same dark cynical strong compelling gorgeous voice that the best young adult fiction has (and what is Catcher in the Rye but a great YA novel?). I saw Zombies & Calculus by Colin Adams in the Princeton University Press catalog and it caught my eye (for obvious reasons). I have no idea how it reads but the premise is so unique that I had to share it. If you're teaching Calculus, it seems like this might be worth taking a look at and then sharing with your students. Adams is the humor columnist for the Mathematical Intelligencer and a professor of mathematics at Williams College. Zombies & Calculus is the account of Craig Williams, a math professor at a small liberal arts college in New England, who, in the middle of a calculus class, finds himself suddenly confronted by a late-arriving student whose hunger is not for knowledge. As the zombie virus spreads and civilization crumbles, Williams uses calculus to help his small band of survivors defeat the hordes of the undead. Along the way, readers learn how to avoid being eaten by taking advantage of the fact that zombies always point their tangent vector toward their target, and how to use exponential growth to determine the rate at which the virus is spreading. Williams also covers topics such as logistic growth, gravitational acceleration, predator-prey models, pursuit problems, the physics of combat, and more. With the aid of his story, you too can survive the zombie onslaught. I had a brutal time in calculus and anything I could have done to make sense of it all would have been welcome. Zombies? Might as well! Perhaps it's not fair to call Sergei Lukyanenko's The Genome (released today) "old school" sci-fi. But the book feels like it comes from another era. Not that that's a bad thing. Not at all. Alex Romanov is a starship master-pilot with an animated tattoo on his shoulder that acts out his current emotional state. He's just been released from a hospital on a distant alien world called Quicksilver Pit. He's low on cash and without a job when he meets Kim, a teenage girl who is getting harassed by some unsavory characters on public transportation. Alex offers to help her out, but she declines and deals with the problem directly by smashing the head of one of her tormentors through the bus's window.